HELLO… We’re Fix8 Design and Marketing. 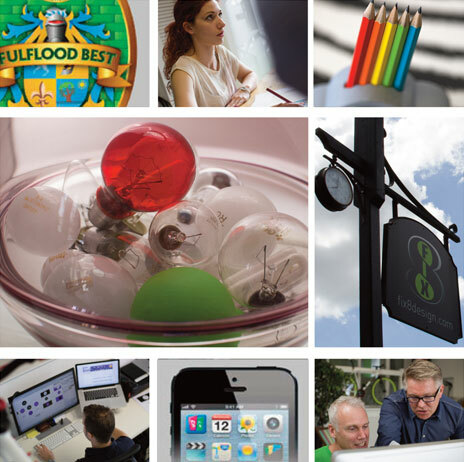 We’re a leading branding and marketing agency based in our sunny studio in Emsworth. If you need help with any aspect of your brand, marketing or website, then we’re the bright sparks that you should turn to. We’ve built up an impressive and diverse client list by producing effective brand strategies, beautifully crafted design solutions and intelligent communication campaigns. We’re fixated with all aspects of design and every project, no matter how big or small, gets our full attention. From initial ideas, through concepts to production – creating memorable work that will have lasting positive effects for your business! Creative solutions and “can do attitude” make Fix8 our first choice for all our marketing material. Never short on ideas or a smile! Andrew & the team have produced inspired designs for us and have always done so with good grace, despite the last minute deadlines we have thrown at them. Always a pleasure to work with Andrew over the many years that he has been creating our catalogues. We really appreciate his style, hard work and dedication. He makes it look easy but we know it isn’t! It’s the attention to detail that makes the difference. Staying late on a photoshoots to get the right shot. But most of all, after nearly 20 years of producing our brochure Andrew’s enthusiasm never wanes. You completely understood our aims for both our business re-branding and new website. Your ideas helped achieve fantastic results, on time and within budget. A true pleasure to work with, we completely recommend Fix8.